Friday, December 8, 2017 figured to be an eventful day at the CIAC offices no matter what the weather forecast contained. The CIAC football championships are a big endeavor requiring a lot of logistics and planning, so the day before they are going to be played is always going to be busy in a typical year. What took place on that Friday became anything but typical and was one of the wildest, most hectic days anyone associated with the organization can recall. 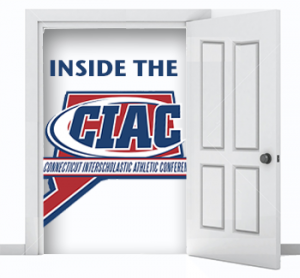 Given everything that took place on that Friday, and the publicity and attention it drew, a blow-by-blow breakdown of what took place, and what went into those decisions seems like a worthwhile topic for this installment of Inside The CIAC. (Editors note – this story is done from memory without notes. Every effort is made to recreate the order in which decisions were made and information arrived). For the purposes of this story, let’s back up to Monday, December 4. 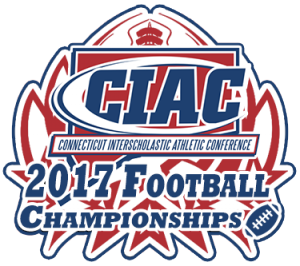 On that day, CIAC announced the schedule and locations for the four CIAC football finals which was: Class LL (Darien vs. Greenwich) 11 a.m. at Boyle Stadium in Stamford; Class L (Daniel Hand vs. Masuk) 11 a.m. at Veterans Stadium in New Britain; Class M (Killingly vs. Joel Barlow) 3 p.m at Veterans Stadium; Class S (St. Joseph vs. Ansonia) 11 a.m. at West Haven High School. That was the plan. It’s important to consider at this point the factors that went into that initial schedule, because they will become relevant again. The parameters for the decision have varied over time. In some years CIAC and the football committee have elected to hold all the games at a single venue — thereby limiting the decision to slotting certain games at certain times. For the past few seasons it has preferred playing the four games at multiple venues with times determined by circumstances — allowing some flexibility based on match-ups and other considerations. In those years, CIAC staff have been communicating with, and securing agreements with, potential sites throughout the year, because hosting a CIAC football championship event is a large logistical undertaking. The sites must be able to provide adequate staffing to handle tickets, concessions, and site maintenance. It must be large enough to hold the number of fans that typically attend a football final, and parking facilities large and convenient enough to accommodate them. They must have agreements in place for police and security to insure a safe environment for those who attend. And they must have staff and administration (usually led by an athletic director) willing to take all this on (with assistance from the CIAC). Along with what is needed from the venue itself, geography, weather, historical fan interest among other things are considered when the final decisions are made. Given all that, and despite some public response to the schedule being a tad tepid, CIAC felt good about it. The schools themselves were excited, the selected venues made sense from a logistics and geographic standpoint, and given the time of year and some potentially ominous weather in the long-range forecast it made sense to have as many games as possible played a bit earlier in the day than usual. After hosting the CIAC Football Championship Media Luncheon on Tuesday and explaining some of the decision-making process, the CIAC was, quite frankly, feeling pretty good. Then things slowly started to change on Thursday afternoon. That sudden change from a forecast a little before 4 p.m. definitely got the CIAC staff’s attention. With snow now in the forecast for Saturday though not looking like too much accumulation, Associate Executive Director Gregg Simon sent a text to staff members Thursday evening asking for them to plan for a mid-morning meeting to discuss the situation. The situation did not improve. That last forecast from a little after midnight is what awaited Simon, CAS-CIAC Executive Director Karissa Niehoff and the rest of the staff when they arrived to the office Friday morning. Now the excitement really begins. Let’s go with bullet points to make this a little easier to understand the timeline. Simon began the morning by calling all eight schools taking place in the finals to gauge what they were feeling about playing the contests given the forecasts. He also contacted representatives from each of the three sites, and got information that would factor greatly into the decision-making process. The sites told him they were still willing to host on Saturday, but that given the forecast if games were postponed they were certain they could not have fields and facilities ready to play on Sunday. That meant along with deciding whether games could/should be played Saturday, CIAC now had to start developing some different contingencies for postponements. In his conversations with the schools early on, the general sense Simon got was that schools felt the early games could be played safely. Around 9:30, as Niehoff, Simon, and a few other staff people settled into a meeting in Simon’s office, the group came to a consensus on what would be the CIAC’s message in communicating with schools. That was that though the forecast looked ominous, CIAC felt that conditions would allow safe travel and play for the three games scheduled at 11 a.m., however the 3 p.m. Class M game which featured the two teams with the longest travel, deeper into the storm, would need to be rescheduled. The group also began discussing the possibility of moving the start times for the three early games to 10 a.m. to try and beat the weather a bit more and play/travel in more favorable conditions. And that all three sites were comfortable with that. in a series of phone calls representatives from Darien and Greenwich indicated they would be comfortable keeping the game as scheduled, and also seemed receptive to the possibility of an 10 a.m. start. The same was true from Ansonia and Masuk, while CIAC had yet to get in contact with administrators at Daniel Hand or St. Joseph. Staff was also holding off on updating representatives from Joel Barlow and Killingly about the plans for the 3 p.m. game with the idea that if Hand/Masuk felt they couldn’t play, that perhaps the Class M game could be held at 11 a.m. In discussions with athletics administrators at St. Joseph in which CIAC details the plan to move the Class S game start time up to 10 a.m. and that Ansonia is willing to play, they tentatively agree to play the game on Saturday. In a conversations with administrators at Daniel Hand and Masuk CIAC is told their district administrators talked and were not comfortable playing the final on Saturday morning. A follow-up conversation with representatives of Joel Barlow and Killingly suggested they were also not comfortable playing or traveling in the Saturday morning time slot. So at approximately 11 a.m. there were two games the CIAC now knew would have to be rescheduled. CIAC confirmed one more time with representatives from Greenwich, Darien and the staff for Boyle Stadium that they were ready to play the Class LL final at 10 a.m. on Saturday. That game remained on the schedule. Dr. Niehoff called WFSB Channel 3 to try and get an updated weather forecast during this period so that CIAC was making decisions with the most up-to-date information. CIAC staff decided it did not want to release any information on the schedule changes until it had confirmed all changes and determined rescheduled dates, sites and times for the games that could not be played in an effort to not have multiple pieces of information coming out throughout the day. A few minutes after the decision comes from the participants in Class M, CIAC is contacted by St. Joseph expressing that given the weather and that they believed other games might be postponed that they were not comfortable playing their game on Saturday. Now the CIAC’s hopes and plans for Saturday are effectively washed away as the only teams that expressed a willingness to play given the conditions are those in LL. The discussion and planning now shifts to determining when and where to play the three remaining finals (and some of this discussion had been taking place throughout the morning as schools were deciding whether the games could go on as planned for Saturday). As noted earlier, the group was operating under the assumption that rescheduling the games for Sunday at any location was not an option. While a weeknight is never the preferred option, the group felt it made the most sense to try and reschedule the games for as soon as possible, which meant Monday night. This decision also came while looking at the long-range forecast for the week ahead which included possibly more snow on Tuesday and very cold temperatures later in the week. There was some discussion about skipping the weeknight option and playing all three games the following Saturday. The concern with this idea was that it would cut even more into the winter sports season which was already beginning, and it also left no margin for error if weather became an issue again the following week. Veterans Stadium in New Britain had indicated that while Sunday would not be an option, the facility was available Monday. Given that New Britain made great geographic sense for participants in the Class M game, and because that was the first game to have been postponed, the decision was made to slot that game into a 6:30 start time for Monday night. Now two games were scheduled (LL and M) with two more still undecided. The group considered possible sites for the two remaining games, with a goal of playing both of them Monday evening as well. The L game had been postponed prior to the S, so those discussions were further along. The first optioned discussed was West Haven High School for Monday night, but conversations with that site earlier in the day suggested it would not be available on Monday. The two other options discussed as possibilities were Trumbull High School (which had been willing to host a championship game before the initial scheduling decision was reached), and Middletown High School which has hosted many CIAC events in the past. A few added challenges arose in securing host sites at this date. The first is that all of the criteria mentioned above that hosts must provide would now need to be secured in an accelerated timetable. In addition, many schools had already shut down their facilities for the season, including winterizing the bathrooms and concession stands — work that was not easily undone. In addition, this was all taking place during the annual national conference for the National Association of Athletic Administrators, which meant that many of the state’s ADs were currently in Arizona. Mike King, the AD at Trumbull High School indicated he was willing to host the L game, but needed to check with his administration along with other people he would need to help in hosting the final. That became the primary choice for the L final if the school was willing. He also indicated they would require some additional help because they were a schools that had already closed down many of their outdoor amenities for the winter and could not reopen them. Meanwhile CIAC staff continued to consider options for the Class S final. The first option was a final check with perennial host West Haven, considering that with the postponements of Saturday’s games that site now would conceivably not host any football finals. Unfortunately the scheduling conflicts for Monday night remained, and that option was off the table. Taking facility size and location into account, the staff came up with the possibilities of Cheshire High School and Fairfield Ludlowe as possibilities for the S final. Both have hosted CIAC tournament events in the past, though not football finals. Cheshire AD Steve Trifone provided a similar answer to Mike King that some of the facilities had been shut down but he would talk to people at his school and see if it would be feasible to host. At this point CIAC was getting feedback from some of the participants that they wanted to release information about the decisions that had been finalized. CIAC sent out a press release at approximately 1:30 indicating the changes for the Class LL and Class M finals, and that the L and S finals had been postponed for dates, sites, and times to be determined. The first domino to fall was Mike King calling to confirm that Trumbull was prepared to host the Class L final on Monday evening. The school would arrange to bring in port-a-potties since the bathrooms had already been shut down and would have a food truck come to serve as concessions (this news may have prompted an exaggerated fist pump from Simon). CIAC contacted Masuk and Daniel Hand to inform them of the new schedule for their game. Shortly after, Steve Trifone called and confirmed that Cheshire would serve as the host for the Class S final. St. Joseph and Ansonia were notified of the new schedule for their contest. Finally Simon called CIAC Tournament Director Jim Benanto who is charged with contacting and arranging officials for each of the games, along with insuring that there are trainers and medical personnel on site at each game. He then called Football Committee Chairperson Leroy Williams to update him on all the changes. At last, at 2:26 p.m., approximately five hours after convening in Simon’s office, a press release went out with the final schedule, and the CIAC websites were updated with the changes. There it is. It was a hectic, frustrating, challenging and ultimately successful few hours at the CIAC offices trying to make the best decisions possible for the teams involved. Would estimate that there were somewhere in the range of 75-100 phone calls placed and received over the course of the day. Certainly people are entitled to question any part of this process, or the decisions that were made, but CIAC felt it might be informative to offer this detailed account to provide an understanding of what was involved in the decision-making process. Ultimately the games went on, and four champions were crowned on the field. Bringing us back to what should always be the focus of CIAC tournaments and championships — the student-athletes and their remarkable accomplishments.